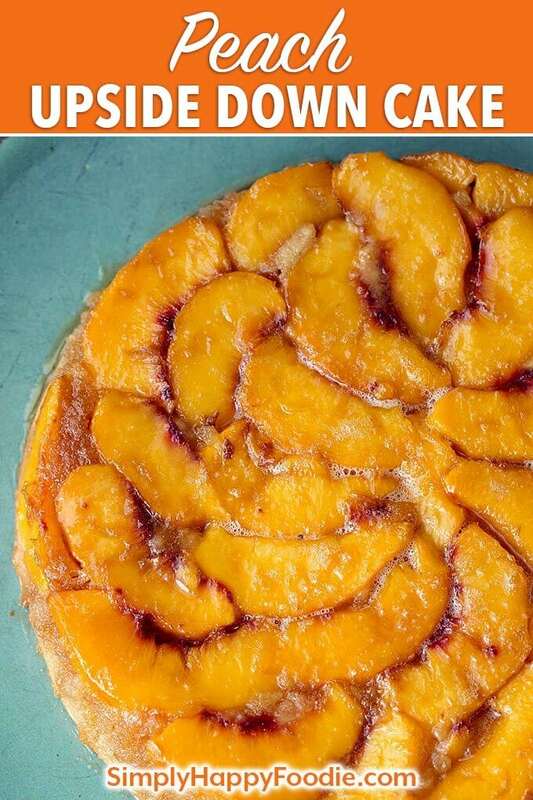 Peach Upside Down Cake is my favorite upside down cake. I do like the pineapple version, but fresh peaches make this an extra special cake. This is a wonderful fresh peaches dessert. What an incredibly beautiful Summer day here in the Pacific Northwest! I’m here with Gizmo, he’s chillin’ at my feet. Paul got home, and before I could hand him a Friday cocktail, he had to leave again. He got something in his eye a few days ago and it is still there! Off to the urgent care. This cake. 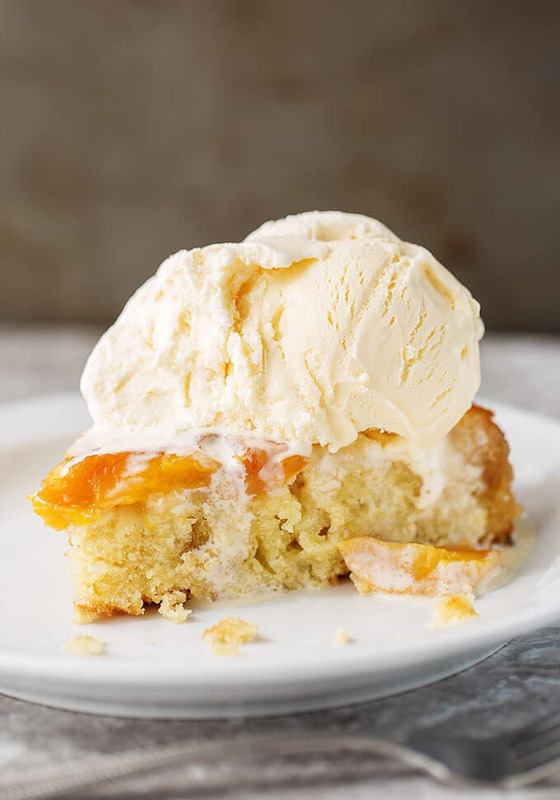 If you love fresh Summer peaches as much as I do, then you need to make this Peach Upside down Cake! It’s a simple cake to make! It looks impressive. It tastes even better! Paul is getting a nice big slice tonight (with ice cream)! A delicious way to use your fresh, ripe peaches! 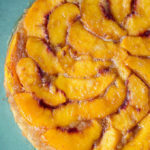 Peach Upside Down Cake can also be made using canned peaches. Melt 3 Tbsp butter in bottom of 9” x 1 1/2” round cake pan. Stir in the brown sugar, mix well, covering the entire bottom of pan. Lay peach slices in the pan, single layer, covering the entire bottom. Add egg, and almond extract and mix for a few seconds until combined. Add the flour mixture alternately with the water, starting and ending with the dry ingredients. Mix after each addition. Spread the batter in the pan evenly. Bake at 350 degrees for 40 minutes, or until a toothpick inserted into the middle of the cake comes out clean. Cool for 5 minutes, then invert onto a plate. Canned peaches can be used. Drain the peaches and reserve the liquid. Use the liquid in place of the 2/3 cup of water, if desired. Very good served warm with vanilla ice cream! 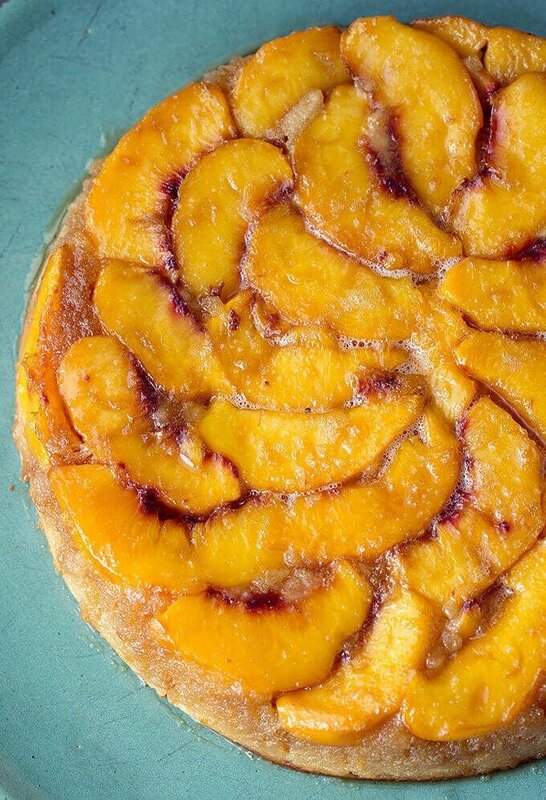 --- Inspired by Peach Upside Down Cake - An Italian in my Kitchen. The white cake is adapted from the Better Homes and Gardens New Cookbook - Pineapple Upside Down Cake - page 93.